Ronald Garan moves a failed pump module from the orbiting space station to the shuttle Atlantis last July. Editor's note: Madhu Thangavelu is space projects director of the Cal-Earth Institute and a fellow at NASA's Institute of Advanced Concepts. He is an advisory board member of the American Institute of Aeronautics and Astronautics with a focus on the design of complex space projects, including space stations and exploratory missions. He also teaches at the University of Southern California. Four decades after the first man walked on the moon, we continue to live in a time of great technological and social opportunity. And yet, without vision, lacking direction and in an apparent state of ennui, human space programs are withering around the world. The new economic powerhouses of China and India show great promise, but I suspect it will take those great nations years of infrastructure building before they can pull off any major feats in this arena, while established rivals-turned-partners like Russia and the U.S. seem to have difficulties envisioning and executing great and exciting new missions. Perhaps the new generation of multitalented professionals seem to have other priorities elsewhere. A new direction in collaboration among government and private space agencies, especially in nations with an established space industry infrastructure, might yield technologies and commercially viable projects that could benefit the world in ways we cannot yet imagine. Human space exploration is in a funk. Membership in the astronaut corps of the United States and Russia has dwindled to an all-time low, their ground and support infrastructure have seen better days, and the global economic downturn is not helping. If things go as planned, commercial space firms such as SpaceX and Boeing will fill some of the gaps left by the abandoned shuttle program here in the United States. Space agencies of the world historically have focused on human space activity primarily to promote national prestige, and more recently as an important venue for international collaboration in the sciences and engineering. It seems natural that human spaceflight activities have been narrowly confined to scientific discovery mainly relating to human survivability and advances in life support and human factors through the building of space stations. A few astronaut-tended missions have also been dedicated to deploying and servicing satellites, observatories and for conducting experiments in basic physical and life sciences as well. It is also clear that human space programs, shaped by policies of the Cold War and then by partnerships between economically developed nations, now need to be reassessed, reconfigured and transitioned to a new era employing the flat-world model, one in which the entire globe of nations might participate actively. For example, human space technologies perhaps offer the best alternatives to protect against climate change by providing reliable and advanced methods to build sustainable shelters for people and livestock and to sustain agriculture in areas threatened by extreme weather patterns. The soft technologies that we don't hear much about - like those employed in the background by psychologists and human factors experts to keep crews happy and productive in deep, alien isolation environments - play a critical role in human space activity. That's why NASA experts were called to help when those Chilean miners were trapped deep underground a few months after a tragic earthquake in 2010. These same technologies are finding their way into Federal Emergency Management Agency projects that provide temporary shelters for populations after natural disasters or during emergencies. However, it has not been easy for the space community to shed Cold War policies that have long been a drag on the industry. Some of these policies suppress creativity and innovation that usually thrive in small and agile organizations. Even in the rapidly advancing and lucrative satellite communications industry, free trade and U.S. exports of components and systems are hampered by rules and regulations meant to prevent the transfer of what are deemed "sensitive technologies." A vast array of commercial projects lie waiting in the wings, and now is the time to act on large, complex building projects in space that require on-site human supervision. By bringing together assets and capital from around the globe, we might see dramatic achievements if we can somehow manage to shed this "us versus them" protectionist mentality of the past century. At this moment, the orbiting International Space Station is the only platform for human space activity. The ISS was born from a select partnership of a few nations. Currently, the scope of projects on this platform is narrow. Deemed a national laboratory, most of the projects currently flying - as well as those proposed - are of a basic scientific and exploratory nature, and a few are meant to extend technology test beds. Human space activity is a much, much larger endeavor than just scientific human space exploration and technology innovation. We must use what we have learned so far for the advancement of society and the benefit of humanity in short order. What would happen if nations collaborated to focus on money-making projects? The list of possibilities is endless: space-based solar power generators, orbiting fuel depots, recovery of valuable satellites and managing orbiting space junk. Valuable international ties could be forged if nations joined forces to develop commercial transportation in space. Can you imagine sending cargo from Los Angeles to Shanghai in 45 minutes? How would you like to have breakfast in London followed by lunch in Tokyo, and still get back in time for dinner and family time back in Palo Alto, California? Space tourism to destinations in Earth orbit or between the Earth and the moon could also be a vital revenue stream. The ISS could be the springboard for many of these activities that have little in common with scientific human space exploration. Even new synthesis-oriented models of interdisciplinary higher education stand to gain. Astronautics is one of the first academic disciplines to synergistically combine diverse basic sciences like physics and chemistry and math with astronomy and subjects in applied sciences and engineering like strength of materials, structural design and electronics. The practitioner had to orchestrate a variety of critical systems to shape the design of missions. Hence the cliché, "It takes a rocket scientist." Human space activity takes it one step further by introducing humans in the loop; perhaps the most temperamental and weak yet versatile link in this hard, high technology endeavor. And so the professional now needs to know all about human physiology, psychology and human factors, not to mention architecture, policy and law, to keep crews safe and productive in a collaborative, team-oriented environment. This is true for the flight crew as much as for the ground crew. The globe of nations is needed to coordinate and support these missions. Yes, NASA's space shuttle is out of business. Yes, the U.S. manned space program relies now on Russia's Soyuz spacecraft and, soon, private industry. Just as the Cold War gave birth to the space race, the world's space-faring nations now find themselves with a golden opportunity to focus on the human race. Let's hope they take advantage of it. The opinions expressed in this commentary are solely those of Madhu Thangavelu. Follow CNN's Light Years blog on Twitter! Just medals in general, how many does America have? And how many gold medals?. The other focal point besides science and manned space flight, is the need for planetary defense agains Near Earth Objects such as asteroids. On November 8th Earth experience a near miss with asteroid traveling 29,000 miles per hour. This would deliver the same impact of many nuclear weapons. Right now humanity has no way to protect ourselves. It is not a matter of if.....it is only a matter of when we identify the next incoming, humanity altering object. This is the time for space programs of the world to unite on a single mission. Thank you, Madhu for offering such thoughtful insight in the current state of manned spaceflight. Your point "now is the time to act on large, complex building projects in space that require on-site human supervision." was one that resonated with me greatly. My perspective with respect to the US population is that we are positioned nicely for a "bump" in interest toward space. My generation and more broadly, those born between 1980 and 1990 are aspect of an echo of the tail end of the Baby Boom. In fact, I recently heard a fact (kindly ignore that I do not have a source, and just, for the sake of discussion, accept it as true) that there were actually more young Americans born between '80 and '90 than during the Baby Boom generation. True or otherwise, Generation Y, Millenials, etc seem to be coming of age during a time of two-fold transition. First, a popular semi-mainstream zeitgeist that appears attuned toward both globalized culture(obviously) and space oriented films(tenuously). In 2011, amid the usual fare of vampires and zombies, three space centric films saw relatively large scale distribution (though, hardly success); Melancholia, Another Earth, and Tree of Life. Though none of these films broke box office records, or truly resonated with large numbers of young people, they bespoke an early turn by the art house movie crowd, to utilize space as a thematic means to carry across larger points. What better metaphor, indeed, for our growing global awakening. Second, that of the end of the Space Shuttle program. Simply speaking, someone will step up. Granted I am deeply biased, but my hope is that Elon Musk's SpaceX carries the proverbial torch forward, offering safe, regular, and relatively inexpensive access and transportation off-planet. Like so many massive cultural shifts, New Space will take time to mature and develop. As it does, I believe that both science and technology will benefit specifically and the ambitions of people like Elon Musk, Jeff Bezos, and Jeff Greason, will fine their way into space via a supportive commercial marketplace. Time will tell. A thought provoking piece of writing. People at the helm of affairs must take note of this. Space tourism and transportation are points worth considering. Power generation and beneficial climatic manipulations are also the possibilities. Best wishes. It would be important for international cooperation. Other countries like China are also developing space ship and international stations separately. If experiences are shared to some extent, more money could be used to explore more advanced, and more ambitious space technology. It was an insightful read. Infact at SEDS India National Conference back in 2009, Rakesh Sharma proposed the same. He spoke at length about how Space at large was too expensive to explore and exploit by a single nation. Though Space race started as an avenue for to superpowers to show the world who is better, I think we have come a long away and it is high time we free Space Exploration from that image and involve more countries and develop a more Human approach to Space as you have very nicely pointed out. It is true that Space has been greatly sidelined(if I may say so) since the Global Financial Debacle and also USA's Wars against Terrorism. Also there is a general resentment among people towards Space considering the enormous amount of money spent without having any immediate benefit to show. It is sure very hard to convince the common man( the taxpayer)that is money is well spent. Though India has been doing very well on the Space front , there is a very strong lobby opposing expenditure in space ( even though it is well known that India spends remarkable less on space when compared to its counterparts) citing the more important problems India has to tend to at the moment. What is important to note at this juncture is how ISRO has beautifully blended Space Technology with the empowerment of the Indian common man. It is well known that the education and healthcare systems have very dismal penetration levels in India and it is not improving at the rate that it should. Now, ISRO with its satellites has been very successful at achieving penetrations that the government and its zillion policies could not have achieved in a long long time. Telemedicine and Edusat's( Education Outreach Initiative) have gone a long way in empowering and nurturing the Indian underbelly and giving them hope and strength to strive for a better life. Giving them a platform to work and uplift themselves. Throwing light atleast onto the road they must trod on if not provide them with a transport. All in all, Space is exciting. It has suspense,mystery,drama and every thing one would want from a blockbuster. It is the longest running blockbuster and will continue to be so for lightyears to come. It is homo sapiens today, could be something else later and it only tends to infinity- that which we never saw , never can and never will. But each time we try and get close to it, we discover something , that which changes us for the better makes us look at the world and ourselves in a different light. It only makes us better and better Mentally, Physically,Philosophically and last but not the least Materialistically. I felt really happy after a long time reading your article. I havent been close to reading about space for a long time now. My world is now surrounded by probability,ai,robotics and the likes. But it is really good once in a while to go beyond all of that and look at the BIG picture. The biggest that there is. If there was/is anythng that kept/keeps me going it is this. I grew up in Melbourne, FL. I watched the Space Race from my front yard. My schools would let us out for a moon shot. Other than the first two Mercury missions, I saw it all. I finally got to see a shuttle shot in 1991. I was always excited about a manned mission. To make space exciting, we need to continue manned missions. Granted, Spirit has done wonders on Mars. But that is just a robot. Robots don't talk to us as other humans in space do. Should we continue manned missions? YES! There are literally people dying of starvation in this country and around the world. It is completely nonsensical to put billions of dollars towards flying around in space when there are pressing humanitarian problems that could be eradicated with even a fraction of that amount. Its so easy to say we shouldnt do new things until all the old problems are resolved. We would still be living in huts if that phiolsophy were adopted. The world will always have problems. These issues can be and have been mitigated by new technologies, new ideas. Space related research has developed new ways to purify water that is currently being used across the globe to improve people's lives. The amount of money spent on space research and development would not fix the worlds problems. Not even for a year. What is lacking in feeding the hungry is not 30 billion dollars but a resolve to care for our fellow humans. You cant buy that. Spending money on space exploration is like spending money on any other human endeavor. Every cent spent is spent here on Earth. It creates jobs and new technologies, providing a stronger financial footing to deal with problems that need to be addressed. The argument that we should not spend money on this until hunger has been eradicated sounds noble, but is nonsensical. How much do we spend on movies every year? How much on sporting events? How much on new cars, or running the air conditioner, or pet food? Is there some moral compunction to stop paying for all of these, and others, until Utopia is achieved? And how much harder will it be to better the human condition in an economy further devastated by the withdrawal of that economic activity? Less people is the answer to the world's problems. Humans are a virus on this planet. Sigh, it is really sad that people look down on NASA, really. All they have done is made our world better in every way possible. So lets say that there is someone OUTTHERE. Dont we want to have technology to defend ourselfs? Or lets say there is an asteroid headed our way and will wipe us from existence don't you think that we should have paid some attention and money to NASA then?? You know it could have saved our lives...but even if you are arrogant to not even understand that don't you think just exploring is just something we DO and something we should be very PROUD of. Oh wait...hell if we didn't explore than we would have never found the America's and might be slaves somewhere NOT having this discussion. I was not born in the US but I LOVE IT. I love NASA as well. It is the one thing that points to us as a race of this infinite cosmos moving forward. NASA gets 18 billion dollars a year for its budget. ALL of the hard sciences get less than 5 billion dollars COMBINED. In my opinion, thats upside down. We need to be giving hard science 18 billion a year, and NASA should receive no more than 5 billion a year unless they can provide concrete justification for additional special spending. And ... No Child Left Behind gets 30+ Billion to accomplish what? Nothing! Two, or three wrongs for that matter, do not make a right. People who are advocating more money for NASA through exaggerated examples of its usefulness not only being dishonest but have vested interest . What was the promised estimated cost of flying the Shuttles as opposed to their real cost? Money does not grow on threes. At least that was what my mother used to say to us. NASA can't hit the way back machine and make the public pine for manned space flight anymore. We have seen the depth of how far ruthless people will go to steal every damn cent we make and our great grand children will make . Frankly,manned space flight is not important when you have no job and are getting kicked out in the street and the banker who is doing that,got the money to stay in business out of your last paychecks tax money. NASA better find some real world applications for it's science or it will be a shadow of the shadow it is today. With regards to space stations; the ISS is not the only one in orbit at this time. The Chinese have orbited a small space station known as Tiangong 1 (Google it). They just did tests involving an unmanned Shenzhou spacecraft, basic rendezvous and docking, done remotely (not really a technological feat; been done since the 1960's). While not as large as the ISS, it is a starting point for larger stations in the future. Ironically, the docking mechanism is Russian designed, and is very similar to the one used by the Soyuz; the Shenzhou could potentially dock with the ISS. When asked why we know more about outer-space than inner-space (oceans), NOAA chief scientist Dr Sylvia Earl (1990-92) replied, "Thats easy. The annual US budget for oceanographic research is $90million. The space-shuttle toilet cost $124million." "Mars ain’t the kind of place to raise your kids. In fact it’s cold as hell. And there’s no one there to raise them if you did." Sir Elton John – "Rocketman"
Chinese use Russian technology. I wouldn't consider them serious about new missions to outer planets. If anything USA and Russia are the only two countries on this planet qualified for next steps, planets and beyond. China and India failed to make their own propulsion systems. They resorted to using modified Russian Soyuz rockets. I would be impressed if Chinese came up with their own new lift systems. For example a new space elevator or new cheaper way of reaching orbit. I dont' see it, because Chinese only copy current technologies. No original ideas. I think Korolev or however you speell it, came up with Soyuz. Waste of taxpayer money. Use those billions here on the budget mess. Besides why should we go to another planet. We haven't completely ruined this one yet. Close, but not yet. The space program has resulted in thousands of scientific discoveries that benefit us every day. And those discoveries have many times resulted in spin-off companies that employed lots of people. These discoveries are what has led to the beginnings of private commercial space companies. Which then need other support businesses. Which results in even more jobs being created. Let's remember that NASA's entire budget is less than 1% of the total federal budget. And also, not a dime of that is spent IN space; it is all spent here in the USA. When Nixon killed all the deep space missions that was the worst thing to ever happen to space exploration. Nixon threw cold water on all the exuberance and optimism of the 1960's that we would venture out into deep space and explore our neighboring planets. And we haven't built a decent rocket since we retired the massive Saturn V moon rockets. We lost 50 years thanks to Nixon. Someone has to be blamed, I suppose. But there have been just a few Presidencies since Nixon's tenure, my friend. With that having been said, I do believe there's plenty of blame to share all across the board. Why do so few posters stick to the topic? Wonderful: Take all gays, get em out of here, as well as all illegals. Wow. Isn't there a Klan rally or something you should be at right now? Thanks so much for adding to the intelligent discussion. I often wonder why it is that some people maintain such a deep hatred for others who may or may not have any choice regarding sexual orientation (Google "hermaphrodite" – the most outward "symptom" of genetic confusion). Many gay people have made enormous contributions to every society on the planet – as have straight people, yellow people, white people, black people etc etc etc. Sometimes, hatred of homosexuality is based on social conditioning imposed by relatives whose newer generations become less ignorant as the years go by simply because, sooner or later, the newer generations actually learn to read and write. Exposure and higher levels of thought process are achieved, basically. Other times, the hatred is based upon self loathing simply because the person who hates is a closeted gay man or woman. Yet, other times, it can be based on imposed sexual experience as a very young child – which may even be understandable. However, the behavior is typically symptomatic and is often accompanied by other types of aggression that frequently create poor social consequences for the afflicted individual. So, which explanation best fits you, Doug? Americans tearing each other's throats out over partisan politics is likely more likely to keep the world from peace than anything else. The financial capital of the world is being torn apart from within due, primarily, to the radical right and the Republicans in congress deliberately stopping the elected president from accomplishing anything. The Constitution and Bill of Rights are held up by the right to excuse the behaviour of Phelps and his wacko family and the spewing of lies and bigotry in the press. It is trampled on to get rid of the protesters exercising their right to free speech and freedom of assembly. Everyone knows there is not enough money to keep the country going even in its broken state but want to spend billions on a space program for purposes of ego not advancement. The outside world just shakes its head and hopes the radical right do not get control of the weapons. I think this is unique in history: A nation that would deliberately hamstring itself out of pique. Completely unrelated to the story above. Nothing but unhelpful partisan rancor. And again, what does any of that even have to do with the topic at hand??? Back to the actual topic here, I'd be excited to see any human make it to mars. And if I could afford such things, I would absolutely be on one of the commercial flights. Perhaps it's wrong when both sides do it. Well....CNN, in it's typical state of liberalism, won't print much about Obama's SOLYNDRA scandal or the political nepotism that caused that mess, there's little information about the troops who have been deployed to Australia and to Africa, we're not reading much about Congress making it legal to conduct insider trading or who the Congress people were that submitted the bill – or who voted in its favor as they wrote laws to send everyone else to jail for the same "crime", there's little about presidential candidates whom CNN doesn't favor...etc etc etc etc....but I sure am glad we get to read about Madhu Thangavelu's opinion that we ought to seek a global cooperative for manned space travel. The ice cream place down the street from my mothers closed for the season a couple weekends ago. Maybe CNN will report that next. Dude, its an opinion blog, not a headline story. And btw, science research and space exploration is far more vital to the survival of mankind than the latest political scandal (aka, mindless nonsense). "Dude", it may be a blog but it made the main page and predominant list of referenced reports – and there's a LOT going on out there that the media has flat out ignored. In fact, many of us "dudes" who DON'T have our heads buried in the sand would like to be able to read about it without having to dig – it's called responsible, unbiased journalism. As for your friend, I never mentioned any particular political affiliation, now did I? 🙂 I mentioned "Congress". But no worries, child, you'll be ok when you grow up. I agree your statement is unrelated to the opinion article. The Solyndra thing isn't really as a big deal as the GOP is making it out to be, your Republicans friends also conducted insider trading so quite down child. Thank you Obama for killing off our space program, even though is has been more important to our nation, and science, in general, from moving forward. Will it bring in more money than it costs to do it? If not you should consider leaving it on the shelf until you can afford it. I love science for science sake when it is affordable. Why not apply that same requirement to defense or entitlement spending? Will it make us an immediate profit? No? Then scrap it! The sad part is, we NEVER make a profit from those types of spending, but basic science research and space exploration benefits all mankind. People don't realize that NASA's largest budget ever was still less than 0.6% of the Federal budget!! Cutting these programs to solve our budget problems is like GM trying to stave off bankruptcy by using cheaper TP in the executive washroom. The shuttle prgram was planned for retirement by GW Bush. Obama was merely in office when the program phased out. But he DID win additional funding for the final shuttle flight; this was not part of GW Bush's budgets. Shuttle program was set to terminate long before Obama; Bush announced that the shuttle would be retired during a speech to announce what would evolve into the Constellation project back in 2004, not long after the anniversary of the loss of Columbia. At that time, it was scheduled to be retired in 2010; Obama allowed it one more year. Remember that the space shuttle is basically 1970's technology (whilst the Soyuz is 1960's); the only thing that changed was avionics. Until we find a more economical way to get out of Earth's gravity well, space flight is just an expensive sideshow, reserved for a few robots and overachieving test pilots. We would be beyond that now, except for the tremendous amounts of energy it takes to boost something to (about) 20k mph to get to orbit, and (about) 50k mph to get out of orbit, to go to (for instance) the Moon or Mars. Once you get there, the living arrangements are relatively easy; certainly no more complicated than living on a submarine. As for 'hitching rides with Russians'; it's true but irrelevant. We've known how to get to orbit for 40+ years. Getting there cheaply should be our next goal. It was easy to set a goal of landing a man on the Moon and returning him safely to the Earth, because it was easy to capture the public's imagination. That's because every human (with eyesight) who ever lived saw the Moon literally thousands of times during his or her life. There was an element of mystery and wonder. Unfortunately, there's very little mystery and wonder about going back to the Moon. Been there and done that. As for Mars, not more than an infinitesimal fraction of the human population has ever seen Mars as anything more than another star in the sky. It will be extremely hard to get people excited about going there. While manned space flight is exciting, romantic, and often necessary – that necessity is rapidly dissapearing. Robotics are advancing to the point of making soldier on the battlefield, pilots in the cocpit, and and astronaut in space obsolete. I dare say that there will be a substantial time in the near future where putting people in space is an unnecessary expense, since our fragile bodies and constant needs limit us so greatly. Now, once the long reach of our robotic arms have explored and developed Mars, Venus, or the moons of Jupiter, or we have learned to exploit space from space, maybe then it will be time to again thrust man beyond the Earth to colonize new worlds explore the universe from ships that can sustain us for the generations needed to travel between the stars. Go back and reread Bradbury – the romanticism was never the journey on the rocket, but what we might find when we were out there. Floating in orbit is not a goal – and until there is one, it is better to send out the doves and ravens to seek out the olive branch. Then we might as well let virtual reality fill the need for our v o y e u r i s m. Society has consumed itself with being a spectator rather than a contributor to its own humanity. Manned Space Exploration is a contribution to 'Humanity'. Without it we're just sucklings waiting for the next spectator high. We need to review why some science fiction shows inspired and fueled optimism for the future of Humanity. No. Most people in the world get absolutely nothing out of the US having manned space flight. Most people in the world are hungry and sick and do not have access to information on space flight. If they did they would be horrified that Americans would rather spend money on such a useless exercise. Likely many Americans who lost their homes or may lose them to corporate greed would rather see the money to to helping average Americans get back on their feet. The sick would prefer it went into health care. The ignorant would rather have decent schools. This list can go on forever. Feeding your ego by wasting money is just stupid. And no one outside the US gives a ratz azz about the image the US is trying to project with its chest poundings and chants of "we did it first." You did it to keep ahead of Russia. Period. Wow, Sandy is quite angry, not to mention misinformed! As oppressed people in the third world use satellite communications to arrange pro-democracy protests, and get the truth out to the outside world, Sandy is wondering what research into space has ever done for anyone. Here's a quick factiod Sandy: The entire NASA budget would not be enough to pay to keep air conditioning for our troops in Iraq and Afghanistan for a week! Do you REALLY think that amount of money would make any dent into world hunger, or that we would get more ROI by giving it to people who bought houses they couldn't afford? Give me a break!! Sandy also likes to throw around the words 'stupid' and 'ignorant' alot. Myself, I wouldn't throw stones if I lived in a glass house. Funk? I'm not sure human space exploration is in a funk but it's on a scheduled decline. 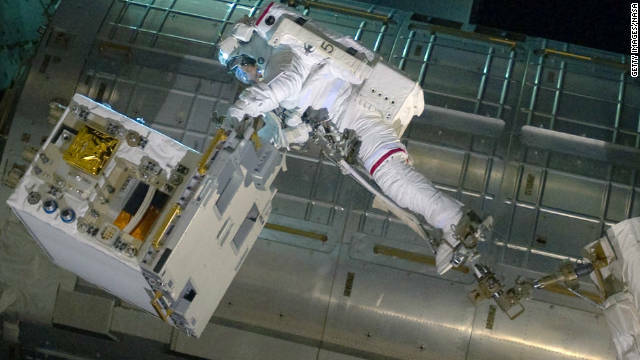 With the ISS built, there's no place for us to go using our existing technology. Time must be spent on developing new methods of going into space and figuring out where we want to go. Romanticizing the glory of Apollo is nice but landing a man on the moon was the single-most important goal NASA was doing at the time. Why can't we go back? My opinion is that we've spread ourselves too thin and everyone still wants NASA to do everything (aeronautics, R&D, human spaceflight, unmanned missions, educational outreach, etc.). If people want us to go to Mars, then that should be our focus but don't try to do Mars and a new space telescope and research for greener solutions for air travel and... keep the budget low. If you want us to go to an asteroid, fine, but you've got to let us work on it for more than a few years before changing directions again. I'm all for killing poorly managed projects and saving taxpayer money but you need people to pick a path and then stay on the path for more than a couple of years before changing directions again. Tell us what the priority of NASA should be. The taxpayers pay for it so they need to choose its direction. What are you willing to pay for? Our government is more intent upon societal implosion to gain control through factional dictates than advancement. It's creative minds that are free to dream and create that we need; not a conformity to political ideology. Good article. But in these times we must focus on our planet rather than others. We have no money for space research at this time unless it can be shared with other nations. With regard to the breakfast in London, lunch in Tokyo and dinner in California? Realistically, not in this century. Economically feasible, maybe. But I'm not sure I want to share our technology with other nations. Such a good ally. Let's stick it to those who support us and give it all up to anyone with a buck. Why do you insist on talking like your allies are a bunch a third world nations? Candarm was a Canadian development as was Blackberry. You are simply not now nor ever the best nation on the planet. You are only one of the great nations. Or were until it became clear that you will let your populace rot. Hard to respect a country that wants to spend billions on a waste of time rather than help its poor and unhealthy; rather throw money at a useless project than improve your education system. If you will destroy your own people you will have no problem destroying everything. CalgarySandy has nation envy that we at least HAD space flight while our brethren to the north have maple syrup. What happens if this planet becomes unable to support us any longer? It has happened throughout history. Ice ages, super volcanos, asteroid strikes, and other phenomena that cause Periodic Mass Extinctions. They have happened repeatedly in the past, and WILL happen again. I for one vote we continue to use a tiny percentage of our Federal budget studying how mankind might survive if in the (perhaps near) future the Earth becomes unable to support us due to global scale natural disasters. There'll be manned space flight as so as they find Unobtanium in them there planets....Or Gold! If they found oil, or other natural resources that could be used on Earth when exploring the moon or Mars, we'd have manned space travel on a daily basis by now. Until a government, or private business, chooses to explore these places and other areas of our solar system to see what else is out there and available to us, they will never see the potential value of any of this. They have found Nebula that have the same molecules as Beer. Now that would be a space trip worth taking! The resources on earth are finite. The resources in space are infinite. Do the math. Its the massive initial costs that keep the private sector from exploiting the KNOWN resources in our Earths neighborhood. Thats why we need an efficient government-led space exploration program to lead the way. Columbus' expedition was funded by Spain, and now look at the private commerce happening between Europe and the Americas. The same can hold true of space exploration if we are willing to invest in it. The picture at the head of this article is NOT of the failed pump module. The hardware being transported by Ron Garan is the Robotics Refueling Mission (RRM) which is a demo of the tasks required to refuel satellites on orbit. And, to correct even myself, the crew member is not Ron Garan but Mike Fossom. How far we have declined in technology in the last 40 years within the space programs is pathetic. There have been countless number of technologies that came from the NASA space program, artificial heart, safer and more efficient air craft design and even material to make fire fighters safer to name a few. Shutting down the NASA space program is the agenda of narrow minded simpletons that cannot see the full value it brings to our economy. "I believe our future depends powerfully on how well we understand this Cosmos in which we float like a mote of dust in the morning sky." Carl Sagan would be really sad nowadays. We have plenty of money when it comes to blowing up our fellow man, but none to advance our civilization. Whenever humanity has a common goal or enemy it thrives. Aren't we tired of inventing or being enemies? Whether there is life out there or not, we are a life form that thrives on the adventure of exploration or dominance. We need to move away from trying to dominate one another. No it does not. It is just a reminder of how little anyone cares about the poor and ill. Not everyone thinks it is a good use of money. On the other hand, if you put just a tiny part of your military budget into this and the rest into making the US a place worthy of respect it would be a grand if useless idea. Our survival does not require the space program. Our survival requires we stop destroying this planet and invest in education and health care. There is nothing other than entertainment in any of the missions for the average person on earth. Some great technology came out of it but not enough to justify the billions just so the US could pound its chest about being the best. Sandy, the planet will be destroyed eventually, no matter (and dare I say, in spite of) anything we could possibly do. If we want to outlive our planet, then yes, space exploration is VITAL to humanity's survival. With the current population already over 7 Billion, are you sure we should try to wipe out all disease? Despite that being impossible at any cost, how do you think the earth would fare if we started doubling our population every couple of years? CalgarySandy – You seem to very animate about what other people should do with their money. Aren't you getting enough of our money through government pay outs? And aren't you engaged in any Charities? It's a bit presumptuousness to claim people aren't doing enough to help people that are actually willing to improve their lives with the help they get rather than sitting back and waiting for the next handout. Creating a Utopia does start with the mindset of individuals, communities, and governance. Expecting top down humanity is much like the trickle down mandates from Elites. The trouble is the Elites aren't all that benevolent and fail miserably at improving humanity. Human imagination and ambition needs to be set free again. Thank you, Professor Thangavelu. You'd be surprised at how many lay people like myself, completely agree with you, and appreciate how you've expressed the situation. We are raising the first generation of American children, indeed children all over the world, since man entered space, that will not be exposed to the wonders of manned space flight. I have nothing to do with space, yet my passion, video & music are heavily influenced by the space program. It gave us hope and most importantly, it excited our curiosity, made us want to learn. The loss of these hidden benefits to our society cannot be underestimated. It will further damage our national psyche and hurt both Wall Street and main street, and we won't realize it until it is too late, so we must take a "leap of faith" when it comes to space. We need to become rabid fans once again. We need go fever. Maybe we should have trading cards of all the way cool rocket men like Dr. Thangavelu. It's time to let private industry get on with the "business" aspects of space – finding ways to make money with things like space tourism and resource exploitation. Governments need to set a big, audacious goal to work towards and then commit the wherewithall to achieve it. I think the only goal worthy of large government expenditures on human spaceflight is to expand the footprint of the human race beyond Earth and settle other planetary bodies. It is the logical next step in the evolution of our species. Here we go again spending more money. When will you people realize money is a man made thing and all governments make up how the rules work for their own country and their own people. When will you understand that money itself has no value? It is a symbol of a certain share of the nations's wealth or lack thereof. It's value is based on, today, the worth of the nation. If you print more than you are actually producing in goods and services then it deflates the value not just in your own nation but in the world at large because this is a global economy. Your economy has become so unstable that other countries are thinking of taking away the US dollar as the benchmark. People who speculate in the currency markets are likely very cautious about buying American dollars right now. Yeah, 0.6% of the Federal budget. We spend more on earmarks or air conditioning. Woopity-doo. I miss the good old days. All the networks would cover a manned Gemini or Apollo mission all day long. The fact that NASA "misplaced" the original alleged moon landing videos does not help convey a sense of respect for the space program. It's pretty obvious they were faking those scenes. Laughable, really, at how fake a low-budget it looks. The propaganda campaign to keep this hoax alive on all levels of the internet is impressive. I think people understand on an intuitive level that a lot of "facts" surrounding NASA events are a load, which is why there is little interest in pursuing space exploration, at least when these clowns are running it. @troll bill. Apollo was my first job...from making the rocket engines in LA to building the command and service modules in Downy and firing them all assembled at the the Cape. They were real, the men were real and the money was real! @troll bill: Wow, delusional. Are you and Scully looking into this "cover-up"? Then you can outsource even more jobs and have the products delivered rapidly to the people who cannot afford them because you outsourced their job. Tell that to all the Americans who are out of work after the decommissioning of the Shuttle program. The "what's in it for me?" mindset is a human archetype, and as such, has been with us since the beginning and will be with us till the end. If the next great drive in human space exploration is to get underway, this is the very question that those developing technologies to get us into space will have to satisfy (ie: making a large profit mining resources that are limited on earth, or energy production), and there's nothing wrong with that. I would also contend that another great human motivator, competition, has led to far more accomplishments than cooperation (track stars going a lot faster in a track meet than on the practice field for example). The motivations of China and India being in line with "cold war mentality" makes me think of the incredible space accomplishments that were achieved during the original cold war. From a space development perspective, if only the cold war could have lasted a little longer! I think the US will continue to maintain a strong presence in space, though we are undoubtedly undergoing a huge transition. Unfortunately NASA is an example of how even the greatest of organizations can meet their demise when wasteful spending and huge directional changes are common practice. I strongly believe that with private industry's efforts in trying to make space exploration profitable, things in the US will soon start taking off again. I would also contend that another great human motivator, competition, has led to far more accomplishments than cooperation (track stars going a lot faster in a track meet than on the practice field for example). The motivations of China and India being in line with "cold war mentality" makes me think of the incredible space accomplishments that were achieved during the original cold war. From a space development perspective, if only the cold war could have lasted a little longer! I think the US will continue to maintain a strong presence in space, though we are undoubtedly undergoing a huge transition. Unfortunately NASA is an example of how even the greatest of organizations can meet their demise when wasteful spending, huge directional changes and bad management are common practice. I strongly believe that with private industry's efforts in trying to make space exploration profitable, things in the US will soon start taking off. The first and only country to land men on the moon is now hitching rides with the Russians. Thanks congress- your vision of the future is so inspiring . . .
You know who gives a shite about this outside the US? No one. How many people are sick of your chest pounding over what you did in the past? Most of the world? Even if you are not a Christian knowing pride is a sin you should still know that no one likes to hear this USA! USA! posturing. It makes you look cheesy and pathetic as it has nothing to do with being a kind or moral nation. If you do a great job you do not need to brag and swagger. If you did not then all the posturing just makes you look bad. I lived in the US for 5 years. I never saw or heard anything like this. They would be ashamed of themselves for thinking that only the US has an value in the world. Its OK Sandy. The US will pay the way for the rest of the world, AGAIN. While people like you don't care or plan for anything but the immediate future, we will put in the resources, invention, and hard work, to carry the whole world kicking and screaming into a better tomorrow.